Mark your calendars. 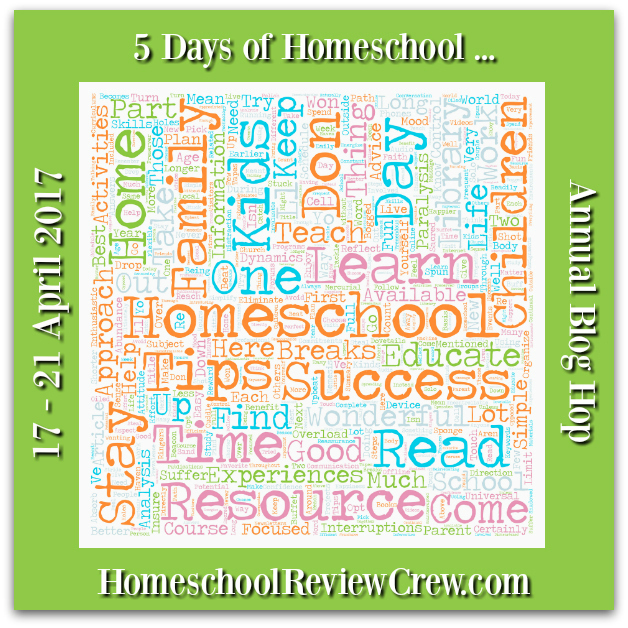 The Homeschool Review Crew are having their annual Homeschool 5 Day Blog Hop during the week of 17 – 21 April 2017. The Crew are busily preparing to share their hearts and souls with you next week in hopes of encouraging and strengthening you on your home school journey. They will be inviting you to join them as they share what they have learned so far on their own personal journey’s. Please note that some of these links will be live today and others will only go live next week when the first post for each topic goes live. The Crew will also be sharing two new review products with you during the week ahead. Debra – 5 Days of Growing a Heart for your Community – I will be posting about reaching out to, and being a part of, your community. Chareen – 5 Days of Charlotte Mason Resoures – I will be sharing with you some of the resources I have been finding to help me in pursuing a Charlotte Mason philosophy in our home school. Michele – 5 Days of Keeping your Homeschool Alive – Join me, homeschooling mom of 19 years and 4 kiddos, as we talk about how to keep your homeschool alive. Amanda H – 5 Days of Homeschooling Without Going Insane – How to homeschool without going insane, and how to deal if you do! 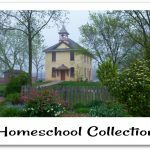 Annette – 5 Days of Things We Enjoy in our Homeschool – Five things that my son enjoys about homeschooling. Come and see what he thinks are the best things. Ashley N – 5 Days of “Kitchen-Schooling” with preschoolers – Read about how we use the kitchen in our homeschool. Kid friendly recipes included! Carol – 5 Days of An Honest Look at High School – Honest answers to questions about Homeschooling High School. Focusing on the themes of forgiveness, fellowship, honesty, and community and how they relate to choosing curriculum, scheduling, and field trips for High School. Cassandra H – 5 Days of Knowing When and What to Change in Your Homeschool – Changes in our homeschool can seem like such a big deal, but they don’t have to be when you know what to look for regarding changes in your school. I am sharing our personal story of the changes we have made in our homeschool to make it much more successful and I hope it helps you to know when and what to change in your school. Christina C – 5 Days of Building Positive Thinking – Sometimes we forget we were made in the image of the most amazing Being in existence. That we have the power to create a more positive experience in all areas of our lives, including our homeschools, our relationships, and our ability to prosper. Crystal H – 5 Days of Creating Independence in Your Homeschooling – In this series we will talk about how to encourage our children to independently complete their schoolwork and even create their own course of study. DaLynn M- 5 Days of Threadbare Homeschooling – Sometimes we all have seasons where we need to scale back to the bare bones because of money, or because of crisis in our personal lives, or just because we’re feeling burnt out. This week, I’d like to share with you some tips and encouragement for those times when you’re in the trenches and needing to do some threadbare homeschooling. Dana L – 5 Days of Homeschooling with Epilepsy and Other Issues – Through this series we will share why we choose to homeschool, what it’s like for us, how we homeschool when we are down, homeschooling with doctors appointments, and overcoming homeschooling challenges. Erin S – 5 Days of Homeschooling with Living Books – Homeschooling can be fun and rewarding utilizing the local library to help you. We love the Charlotte Mason approach and are using her philosophy on living books versus twaddle in our homeschool. Felicia M – 5 Days of Living the Bible in Your Homeschool – Introducing the topics that I’ll be covering in this Blog Hop: Taking Time for Yourself, Having Patience, Bible Study for You and Your Kids, Biblical Discussions, and Putting Curriculum Aside. Hillary M – 5 Days of Morning Time for All Ages – Morning time is traditionally thought of as a learning time for young learners. Last summer, I realized that we do have morning time even though my children’s ages are all across typical school range (16 years old down to 7 years old). I didn’t call it that, of course. I just needed to come up with a better name and let the older children have a say in some of what we studied, then they would be more agreeable. Morning Time for All Ages is really possible. Jaime G – 5 Days in the Life of a Stressed Out Homeschool Mom (and how not to be one) – As homeschool moms we often feel like have to do so many things we can’t do anything right. Ever feel that way? Is is the mess around you, the cooking and meal planning, the little ones, the school room, or just time management? Or maybe all the above! Join me as we confront the things that stress us out and how we can undo that stress and get in control! 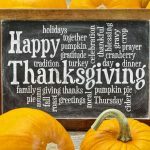 Jennifer N – 5 Days of Books To Help Homeschooling Moms – Posts about my favorite posts that have helped me in my homeschooling journey. Jodi G – 5 Days of Hiding the Word in Their Hearts. – Each day, I will be sharing something that we have found helpful for remembering God’s Word and bringing it to mind regularly. Karen W – 5 Days of 5 Days of International Studies for Young Children – We are going to explore 5 of the countries and cultures we have been learning about this year. 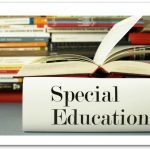 Kelly KL – 5 Days of Homeschooling Children with Special Needs – Find encouragement and resources for you and your special needs child. Kirsten W – 5 days of Homeschooling Twins – I will cover a different aspect of the trials and joys of homeschooling twins. How do you get them to listen to you and not each other? How do you keep them from comparing themselves to each other, constantly? How can you turn your life with twins into a wonderfully augmented homeschooling world? So drop by if you have twins, or just if you are interested in homeschooling and have more than one child. Odds are that I have had similar hurdles to cross that you are now facing. Kristi H – 5 Day of Preschool Math – Join me for five days of math ideas for your preschooler/kindergartener! All of these activities will encourage number sense, and most of these activities will involve being outside in the sun! Kym T – 5 Days of the Rewards of Homeschooling Teens – I’ll be sharing about the rewards of homeschooling your teens through their high school years. Yes, it can be very rewarding, and there are days I need that reminder just as much as anyone! Linda S – 5 Days of Wit and Wisdom from Veteran Homeschool Moms – You’ll enjoy these visits with veteran homeschooling moms who share about their highlights and hard days along this journey of educating children at home. If you added them all together, Linda and her friends have been collectively homeschooling for more than 100 years! 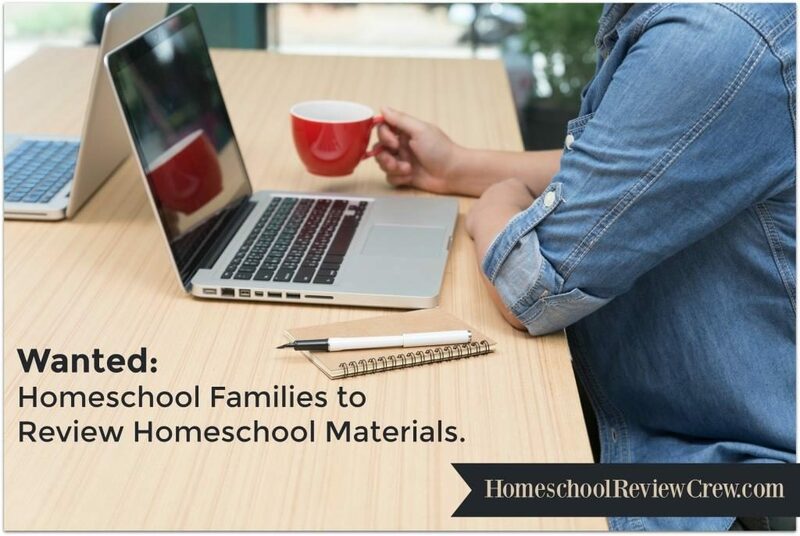 Lisa M – 5 Days of Popular Homeschool Teaching Styles – Come learn more about homeschool teaching methods, and explore four of the most popular ones! Melissa B – 5 Days of Extracurriculars to Add to Your Homeschool – Enrich your homeschool experience with extra curriculars. This week, we’ll highlight some of our favorites! Meredith D – 5 Days of Homeschooling a High Achiever. – Homeschooling a high achiever just happened to us and now we’re facing a high schooler who may graduate at 16. We address how this happens and how to handle from this point forward. 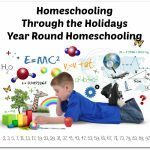 Monique G – 5 Days of Homeschooling the Middle School Years – My post introduces the 5 Days of Homeschooling blog hope and introduces the topics I will cover during my 5 Days of Homeschooling the Middle School Years. I will be talking about changes that come with middle school, independent learning, read a-louds, and how to survive. Rebekah T – 5 days of Simple Homeschooling in a Complicated World – Life got you down? This series will provide practical ideas to help you implement a simple homeschool lifestyle no matter what your circumstances. Ritsumei H – 5 Days of Homeschooling Books – Books matter. And it matters that they be good books: the best that we can find. Wendy R – 5 days of Homeschooling Kids with a Large Age Gap – This post tells of one family’s experience homeschooling kids when you have a “gap baby” (or two, or more) in the house. Yvie – 5 days of Road-Schooling – Tips and tricks for homeschooling on the road from a seasoned traveler – and why we continue to do what we love, even when it’s hard.